When you play the game of thrones, you win or you die. Right now it seems McGillis is learning this lesson and others on the reality and nature of power as things continue to pick up speed in Iron-Blooded Orphans. This is especially true with the Gundam Bael on the field and under McGillis control, what this means for the series however is still up in the air as we move into Episode 44 “The Man Who Holds the Soul” - while it is clear the episode refers to McGillis, does it matter all that much? As the episode opens confusion and chaos reign supreme as is often the case in a coup d’état and make no mistake what McGillis is doing right now is a coup d’état. However unlike other Gundam coups our heroes are almost certainly co-conspirators in the entire thing. It is why Orga’s reaction to the confusion emanating from the Gjallahorn Officers is so fitting, the man knows not everything is going according to plan. Back on earth with Gaelio’s announcement about McGillis’ culpability in his own “Death” things are unstable to say the least. Almiria is clearly heartbroken her beloved “Macky” was responsible for her dear brothers death. While understandably Gaelio’s father is outraged at his son in law. McGillis though is rather nonchalant about the entire situation demanding the rest of the Seven Stars side with him in the name of Agnika Kaieru. Here it appears McGillis is facing a rather simple issue regarding the nature of power and control. McGillis assumes based on tradition and legend that Bael grants him authority over Gjallahorn and by traditions diktat the fellow members of the Seven Star must obey. However they resist, why? Well it’s pretty clear the man they would aid is facing a much more tangible source of power - a gigantic all powerful space fleet. The fact McGillis and his followers seemed to put so much faith in the ability of Bael to win hearts and minds gives credence to Elion’s assessment of McGillis from last episode. He is a child, grasping at stories and heroics, unaware of the true nature of the world. Where power comes from multiple sources not just tradition and history, but raw power and right now Rustal Elion has power. McGillis does not. In space the Ellion faction of Gjallahorn is preparing for battle with Vidar likely leading the charge. As the Vidar Gundam seems to be undergoing changes, however that is not the only events taking space. IdIok too makes his return to the series more dejected then we are used to seeing from our pretty idiot antagonist. Of course Rustal Elion is not one to sugarcoat things lashing into idIok in his own calm way. However as he does so in a scene of exposition that Iron-Blooded Orphans does so well he explains to the viewer the situation at hand. IdIok might be a fool but due to history and his clear love for his men people follow him, that is his power - the power to bind people to him based on his dumb but sincere honesty. 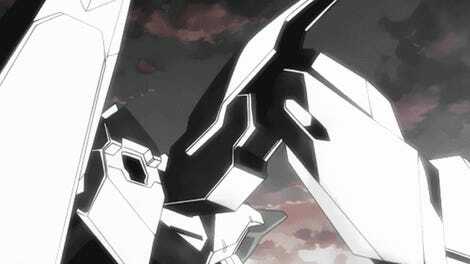 McGillis though has none of this being an outsider, instead he must seize power; his method the legend of Bael. It is clear though that Rustal Elion has no uses for such childish things like legends, which is why he does not fear McGillis. He knows fundamentally McGillis miscalculated the effect Bael would have on the other members of the Seven Stars. Following this is a scene of surprising poignancy where Almiria confronts Macky over his sins. Planning to kill him his words quickly break down the young girl who realizes she cannot fulfill her stated aim, instead she moves to take her own life. While Macky was willing to accept death by her hands he could not allow her to die, for he had vowed to make her happy in the end. Taking the knife through his hands he prevents Almiria’s suicide attempt. As he leaves Almiria thinks on what is said and while she is clearly still in love with the man, a love that even seems to be reciprocated, she thinks everything he says is crazy. Following deliberations the captive heads of the Seven Stars comes to a reasonable compromise. While they will not disobey Bael they cannot fight Rustal Elion and the Arianrhod Fleet splitting Gjallahorn, instead they will stay neutral in the conflict. Angered by this he demands to know why they are opposing Bael, they simply answer the rules that Govern Gjallahorn are relics of the past; from the time of calamity when a strong powerful leader was needed. Now a leader of that type is not needed, showing the power of a legend is not that its all cracked up to be. This is of course news to Orga and Tekkadan. 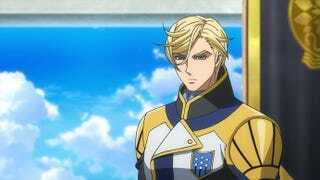 Who by now are firmly linked with McGillis and in his factions orbit, furthermore with the full force of the Arianrhod Fleet barring down and no friends but McGillis to speak of. Tekkadan isn’t caught between a rock and a hard place, no they are caught between a slim chance of life and total oblivion. Orga makes the sensible choice and moves ahead with the only chance they have. After scenes involving many characters setting up what really feels to be a climactic battle next week, we are treated to a touching scene between Atra and Mikazuki. Where both characters in their own ways seem to express feeling for each other. As Mikazuki embraces Atra promising to protect and return to her so she doesn’t need to cry anymore. As I have made clear I thought the theme of this episode was power. McGillis thought he had it when he didn’t, Elion is convinced he does which is why he moves so quickly against his rival. All the while the historically powerless Tekkadan is caught in the middle. How the “final battle” will play out is any ones guess, however I personally cannot wait to see it come to pass. Though call me crazy as we do have at least five episodes left in the season/series what do you want to bet this may be somebodies last battle, but it wont yet be the true final fight. Gundam Unicorn isn’t just one of the best modern Gundam series in a while. It’s also one of the best for music and its opening Into the Sky is a recent favorite of mine. Why do I like it so? Well to be honest that’s a very simple answer it is high energy and quite catchy. If you’re a fan of Japanese pop-rock you’ll enjoy Into the Sky.